If two’s company and three’s a crowd, then High Brow Cat progeny are a virtual mob at the National Cutting Horse Association’s Summer Cutting Spectacular. In it’s third day of competition High Brow Cat is showing his leading stallion style with 16 of his get dominating the field in the second go of the Open Classic, a total of 14 percent of the contenders. The next closest is Dual Rey, whose mares are an excellent High Brow Cat cross, with 11 percent or 13 contenders. Among the High Brow Cat stars are Bamacat, owned by the Bamacat Syndicate and ridden by Austin Shepard. 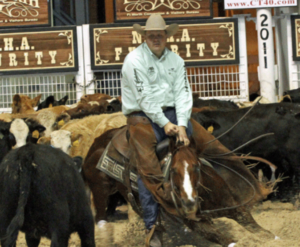 Bamacat is a clear favorite, having won the Augusta Futurity Classic and the Mercuria World Series of Cutting at the Houston Livestock Show and Rodeo earlier this year, while being a top finisher in number of other contests. Also expected to rise to the top are Cattalou, owned by Curtis Chester and ridden by Beau Galyean and Cat Rey Lou, owned by Claire Binkowski and shown by Jason Clark.